IN A GLANCE: Stunning, full of detail! The Maze Runner is so packed full of detail in the right ways that I couldn't get enough of the story. I saw every word play out in my head as if I was watching a movie! I loved reading every word and every page of The Maze Runner, I know a lot of bloggers say something like this but its so true for me about this book. I listened and read this book at the same time and it had me sucked into the story so much that I got goosebumps reading parts of it. 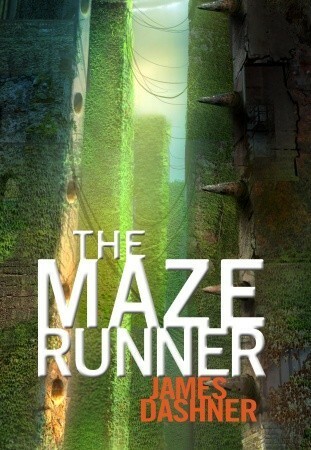 The Maze Runners plot is so solid and so detailed that it seems that its a movie being played out inside your head as you read. I loved the characters in this story so much that I couldn't help but cheer them on or scream at them at some points as well. The main part of this book is about the boys stuck inside of a court yard I guess you would call it and all around them on the outside of these huge doors is a crazy maze that they have to try to figure out so they can try to get back to their life's. The thing is they don't remember their life's! Then one day a girl shows up and all of the sudden everything is turned upside down! This story is jam packed full of twists and turns and keeps you right on the edge of your seat the whole time. I couldn't stop reading/listening till I knew what was going to happen to my favorite characters. I will say my favorite characters (since I know I can't pick one) would have to be Chuck, Newt, and Minho. I love how brave Newt and Minho are and I love how Chuck was like the little brother in The Maze Runner. I really enjoyed the part where Chuck played tricks on the other boys. Also, in this story I loved how each boy had their own job and how organized the group was. Each group in the living area had their own tasks every day, even the runners and each group had their own names as well. Like I said, this book is so detailed but in that perfect way that keeps you wanting more. If you haven't read this book its a must! I couldn't put it down and if a dystopian book is what you are looking for this is an amazing one! I can't wait to start the next book in this series and I already have it on audio, so I'll be listening to it as soon as I can! Make sure you are on the look out for my review for The Scorch Trials very soon!! !